Black Bears pip KCC Egis 100-88 at Seri Mutiara Cup. The team from Macau finished however last in Group A with a 1-2 record. KCC Egis advanced to the semifinals from the top place with a 2-1 record. 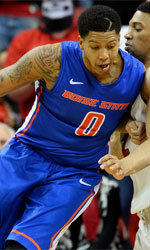 Mikh McKinney (184-G-92, college: Sacramento St.) top-scored for the winners with 29 points and Ryan Watkins (206-C/F-91, college: Boise St., agency: Two Points) netted 27. Anthony Tucker (193-G-89, college: MSU Moorhead) followed them with 20, whilst Chonpong Lao notched 11. Jinyong Kim (201-C-94) replied with 12 points in the losing effort and Brandon Brown (201-PF-85, college: CS San Bernar.) as well as Yoo Hyeonjun (183-PG-97) scored 11 apiece.